Our art gallery is in the Jon Young hall at the synagogue. We feature different member’s art across a range of ages and genres. We occasionally have a guest artist, all sales in our gallery provide the synagogue with commission. I am honoured to be given the chance to showcase my art in the Jon young Hall. I love all forms of paintings and drawings. I have done my elementary course of Art, but then chose to do an accountancy degree as numbers are my other passion. I am a self taught hobby artist. When a piece is completed, it gives an immense pleasure and satisfaction of creativity. Art is the oldest method of human communication, dating back to cavemen; the painted canvas can express and communicate the unspoken words. Though I love traditional art and am a great fan of the Renaissance era, my way of expression is through modern abstract art. I love to explore my own way whilst creating. I've chosen to use different mediums and methods to create my own pieces. Sometimes I know what to paint and I begin with it. But as time and colours go by, the outcome is totally different as planned. Sometimes I don’t know what the painting is going to be but start painting anyway… and the outcome is something I had always imagined. Richard is a retired Solicitor and a warden (formerly head warden) of the Synagogue who has been passionate about photography since his teenage years; he still has and occasionally uses the camera his parents bought him for his 21st birthday, an Olympus 35 ECR. The wildlife images on display here represent only a very small part of Richard’s portfolio, which also includes Landscape, Travel and Street photography. Although many photographers these days play around a lot with Photoshop, Richard prefers to get the image right in the camera so far as possible, meaning his photographs usually require only minimal post-processing. Whilst the majority of his work is in colour, Richard is also a very keen monochrome (black and white) photographer, a medium he considers to be emotionally often more expressive than colour imagery. Richard lives near Ampthill in Bedfordshire. He was awarded a Licentiate of the Royal Photographic Society in 2013 and is currently working towards his Associateship. He belongs to the Documentary, Landscape and Travel Groups of the Royal Photographic Society and is currently Chairman of Bedford Camera Club as well as a member of Ampthill & District Camera Club. In October 2017 he was appointed a Judge within the East Anglian Federation of Camera Clubs, of which there are about 130. Richard uses Fuji mirrorless cameras (mainly the X-T2 and X-Pro2) for all his work, with a mixture of prime and zoom lenses ranging from ultra-wide angle to a powerful zoom. The images on display here – from a Kenyan safari in November 2017 - were all taken using a combination of the Fuji X-T2 and 100-400mm zoom, mainly using manual focussing for accuracy and were printed at home on a Canon photo-printer. l.
In my working life I deal with carefully measured solids and voids. However when I paint I enjoy the fluidity and ambiguity that this medium allows, and collaging enables me to bring another dimension into play. Over the years my art has evolved through stages of figuration, deconstruction, abstraction, surrealism - and back again! The visual culture of Japan has informed this latest series of paintings. My emotional responses to the landscape and mythologising of the human form provide my subject matter, but so does the untamed liquid quality of paint itself. My art is a precarious balance between material anarchy and human control. Laurence can normally be found in the community teaching our bar and bat mitzvah students and leyning to adults. He has always showed a keen interest in crafts, whether it be ceramic painting, model aircraft making or model railways. He has created many designs inlucidng necklaces, earrings and bracelets and uses colour blending in his work to complement the metals and glass used. He started his company, Elle-O-Elle, in November and is pleased to be able to show some of his necklace work here at Radlett Reform Synagogue. Eva launched Crescendo Art focusing on glass creations in 2012. She is a self-taught artist and she applies her experienced with oils, acrylics and mosaics into her glass pieces. Her vision is to become a key driver for innovation in the glass art field. Her creations include three dimensional pieces and show her exploration of innovative techniques combining painting and glass fusing. Her themes are inspired by her Mediterranean background and focus on nature, the cycle of life and biblical themes. She is well renowned for her "Tree of Life" collection. She has an extensive collection of Wall Art and functional glass art and Judaica, including creations with Chuppah Glass. Eva exhibits on a regular basis and welcomes commissions. She also runs glass workshops. She is a member of the Contemporary Glass Society. Gerald was born in London on 23rd February 1929. When Gerald left school during the war, there wasn’t much education around, and he was mainly ‘digging for victory’. Eventually Gerald went to City University and graduated as an optometrist. He went into practice and worked for someone for a year before starting up his own practice, which he had for over 30 years, and of the many patients he treated, he ended up testing the eyes of the grandchildren of one of his original patients. As well as practicing Gerald also taught optometry. In all this time he loved drawing, and went to the Toynbee Hall Institute in Whitechapel to better himself. Gerald’s wife passed away in 1993 which prompted him to sell his practice, but he has always carried on with his love of drawing. Our artwork for November and December was by the late Matt Malitskie z''l. Matt, with his wife Lyn, was a founder member of our synagogue. The inspiration for his artwork came from his childhood growing up in Pretoria, South Africa, after being visited by a 'muse' telling him to paint his memories. He worked as a pharmacist in Watford, arriving in the UK in 1964, his family being unable to accept the destruction of basic human rights in the apartheid era of the 1950s and 1960s. Matt, used different techniques, a range of which are in this exhibition, painting with 'just about anything' from pastels to his innovative technique of using powder colours, mixing them with a binding solution and applying them with a builder's trowel, then using a pen and knife to shape the composition, filling in the details with fine brushes. Whilst he was not a political man, he painted things which fired his morality, his feelings of what is right and wrong. He also sculpted in clay and constructed pictures using different household materials. Matt was a member of Watford and Bushey Art Society and his work was featured in several local exhibitions. Our artist for September and October was Lana Young. 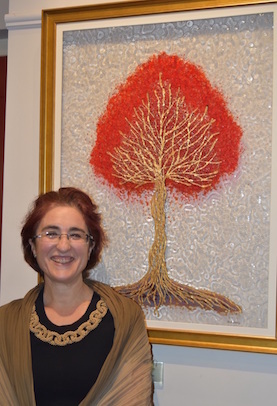 Lana Young is a teacher of Judaic Design for embroidery and a professional Textile Artist. She has been involved with fabric and thread since taking Art & Crafts at Teacher-training College in the late 1960s. Commissions have included many items for synagogues as well as personal ritual items and secular pieces. She specialises in machine embroidery, but employs many allied techniques in her work, which has been exhibited both in the UK and in the United States. Lana’s design & embroidery workshops have featured at museums, schools, conferences, interfaith groups and synagogues. In 2000 she taught at a pre-Pesach seminar in Kiev, working with 80 leaders of Belarussian & Ukranian Jewish communities. Although her work has mainly been commissioned by Jewish organisations, Lana is equally happy working on secular items such as masks, paper images, wall-hangings etc. At Radlett Reform, Lana’s work can be seen around the synagogue, her Ecclesiastes quote is hanging to the left of the Bimah, the four embroidered chairs on the Bimah represent the four elements of Fire, Water, Air and Earth and two of her Torah Mantles are in weekly use together with one of the High Holy Day ones. She has made 13 Torah mantles, as well as Ark curtains and bima covers, to date, as well as working with community groups to make their own mantles. Our artist for July was Gregory (Grisha) Kirby. Gregory Kirby has been creating art from a very young age. He constantly explores new ideas and new ways of creating interesting and unique compositions. Many of his works take inspiration from the natural world and depict snapshots of life that surround him, however many are often more abstract as he is fascinated by the ways in which unity through compositional balance can be achieved. At 18 years old he has recently completed his A-levels, including Art and Design in Dame Alice Owen's school. His work has been exhibited at the National Students' Art Exhibition at the Mall Galleries, the RBA Rising Stars Exhibition at the Royal Overseas League and at the annual exhibition at the Royal Society of British Artists, as well as winning the title of RBA Scholar. My husband and I have lived in Radlett and been members of the synagogue (in all its various stages) since 1978. We have been married for nearly 50 years; have four children and fourteen grandchildren. I have always enjoyed drawing and painting, but only started painting properly when I retired from the Health Service. I paint in all media and enjoy experimenting in various styles of painting; however, my favourite medium is oil. I belong to two art societies: the Elstree Art Society and the Radlett Art Society and have exhibited at both, as well as at the Harrow Art College. I do various commissions and have sold many paintings. I won the ‘People’s favourite painting’ at the last two Radlett exhibitions. I have recently become the secretary of the Radlett Art Society, where the Committee is busy organising its annual exhibition at the Radlett Centre on the 1-8thJuly2017. My paintings often reflect my large family, my childhood holidays in Wales and my husband’s love of jazz. This photo shows me in front of my painting of my husband playing the keyboard, exhibited at the Hertfordshire Open Studio event in 2013. We welcome back local glass artist, Eva Edery to exhibit in March/April. February's artist is Sam Kaye. 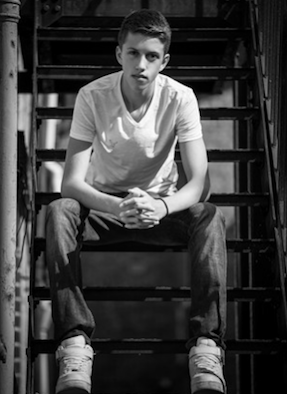 Sam grew up in a photographic family, with his mother and grandfather both being professional photographers. All the stunning pictures on display were taken when he was just 12 and were part of his qualification panel for the Royal Photographic Society for which he passed his Licentiateship. He’s now studying for A levels and hoping to study Geography at University next year. This summer he has a trip planned where he is hoping to add to his photographic portfolio. Our artist for December/January is Su Kaye, she writes about herself and her exhibition of iPhoneography. iPhoneography is the act of creating photos with an iPhone, where the images have been both shot and processed on the iOS device. After originally training and working as a primary school teacher I have worked as a photographer for the last 20 years. I was very fortunate to start my photographic career with my father, Paul Kaye, at his Central London studio where I learned the craft of photography and the fine skills required for timeless classical portraiture. Within 3 years of being in the industry I had achieved my Fellowship with the British Institute of Professional Photography and the Master Photographers Association and had become a member of the elite Kodak Gold Circle. In 2001, I opened my own studio in Radlett and have welcomed families from around the world, many of whom I now see on a regular basis. It has been a real privilege to watch many families grow and to regularly record these changes. I have sat on many judging panels around the world. I am now teaching both in the UK and abroad and include a variety of topics such as photography, learning to use your camera and most recently iPhone photography. The collection of images here are all taken on and then edited on an iPhone. I wanted to show the variety of styles that can be created using different camera Apps and different editing and finishing Apps. Many of the traditional styles of photography can now be achieved with a little creativity and an iPhone. More about my work can be found at www.sukaye.com. 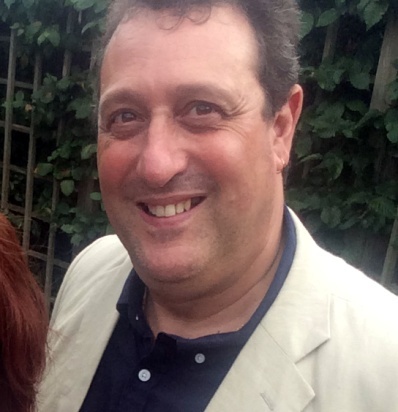 John z”l and his wife Brenda were one of the sixteen founding families of the then Bushey and District Reform Community in 1971, which moved to Radlett in 1982. John was a professional photographer and a talented self-taught painter. His works are in the possession of several synagogue members. We are grateful to Brenda for loaning us some of his paintings for this exhibition. Carole was born and brought up in Port Elizabeth, South Africa. She can not remember a time when textiles were not part of her life. Her relationship with the touch, smell and colour of the cloth began as a young child picking the pieces off the floor of her tailor grandfather’s cutting room. In her twenties she was the head designer of a large South African lingerie company before taking up ceramics. On arrival in England, without a kiln, she returned to fabrics and has specialised in Judaic Art, including Chuppot and miniature torah mantles. Our artist for August was David Slapper z”l who sadly passed away shortly after this exhibition. David started painting at the age of 8 years, and took it up again in the last two years due to a terminal illness, which helps him to express his feelings. Many of his paintings are displayed in the Dialysis ward at the Watford hospital to help the patients there. It gave him great pleasure to know that his work was being exhibited at Radlett Reform. John has been a passionate photographer since first venturing into his Dad’s darkroom at the age of 10. He has combined a career in the law with weekends taking Wedding and Bar/Bat Mitzvah photos but now prefers picking up a camera for the sheer enjoyment of capturing the flux of life. Still photography has an extraordinary ability to show us the poignancy, beauty and fun of life. There is little more rewarding than being in the wilderness with a camera and a tripod, or wandering through a city, camera in hand, to the constant delight of his ever patient wife! I am a Solicitor by profession (now working part-time) but photography is my ‘out of hours’ passion. It began in the 1970’s when I was a law student in Leeds. I still have the camera that my parents bought me for my 21st birthday, an Olympus 35 ECR rangefinder-style camera with a split focus screen and electronic metering. It was advanced for its time and still works, although batteries are hard to come by! Today I enjoy most photographic genres, including landscapes and wildlife, but for this exhibition I have chosen to display some of my ‘street photography’ work, nearly all of which has been shot on a rangefinder-style, Fuji mirrorless camera and converted to monochrome, which is something that street photography traditionally lends itself to. to capture the light and shadows on our streets and, in so doing, to put a little artistic interpretation of my own into the street scene in front of me. My work focuses on the physicality of mark making, the play of light on objects, and the beauty of the natural world and the way that we, as human beings, effect it. allows, creating an uncertainty in my work which feels lively and energised. I am very interested in the destructive and paradoxically constructive nature of human beings and how our actions can create and destroy. In particular how we affect the natural world, sometimes leaving behind a trail of irreversible damage and altered landscapes. Although the destructive nature of human beings is a creative force that I feel a need to manifest in my paintings, I am more intent on expressing the awesome magnitude of the beautiful world in which we live. I have always enjoyed art, drawing and painting from a young age. I studied art at school, completing my A level in 2008. After school, art continued to be a hobby – I attended and then ran Art Soc at the University of Birmingham, which held life drawing classes and gallery visits. I now work in events fundraising on the Memory Walk Team at the Alzheimer’s Society. Last year, I wanted to give people the chance to learn and practice art so I ran Art Club at the synagogue, also raising money for another charity – Arts 4 Dementia. I like to play with the colours and scenes of the outside world. I hope you enjoy my paintings.